We moved into our house just over two years ago and life has been so busy that we have really just done the bare minimum to decorate. We added a few pieces here and there, but for the most part, we used what we had and focused on more urgent tasks. With 6 kids, 2 dogs, 1 bird, a yard that got a little overly ambitious with the grow boxes, and a full-time work at home job, time is not something I have a lot of. School is starting for us soon and everyone in my house is looking at a pretty full schedule this year. I knew that we needed to have a plan to make the most out of the time that we did have together as a family or we wouldn’t have any quality time together until next summer. Our family room is the gathering place in our home. The only problem is our decorating style in this room can be described as “in progress”. We’ve pulled pieces from other areas of our home, that don’t entirely match each other, and moved them around as we tried to decide what kind of look we wanted in the room. Before my kids headed back to school, I wanted to transform this room into a place that was inviting and we could all look forward to spending time in. The little details can really do so much for setting the mood in a room. 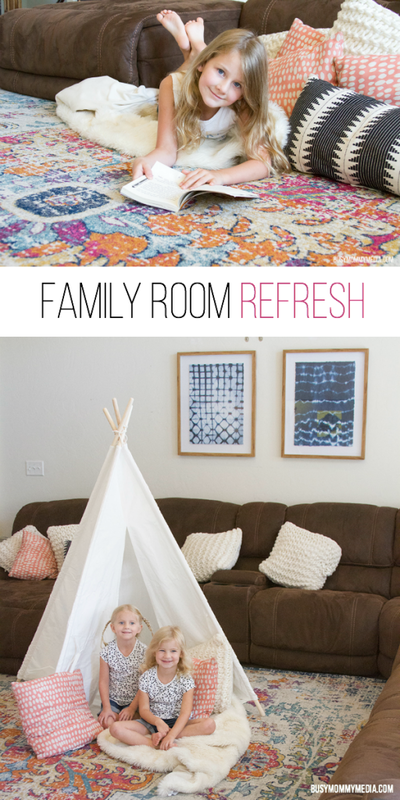 I wanted our family room to feel cozy and be somewhere that my kids wanted to gather. 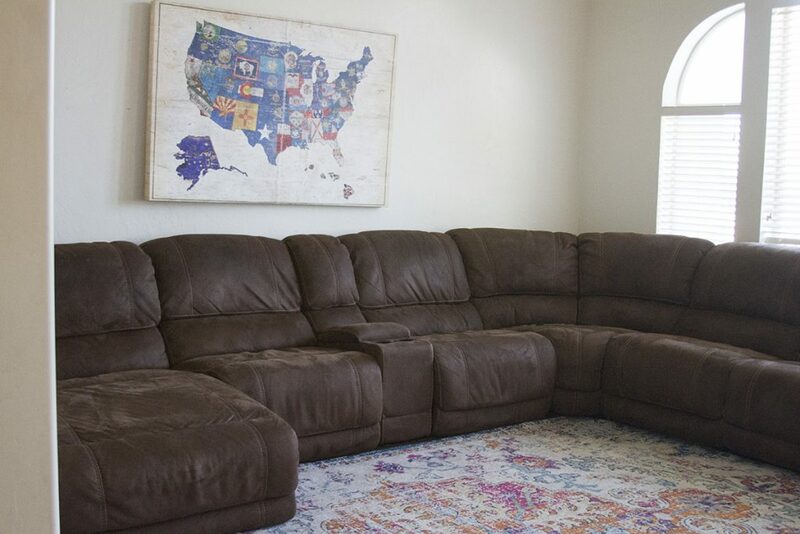 We have wall-to-wall carpet in this room with a large area rug. 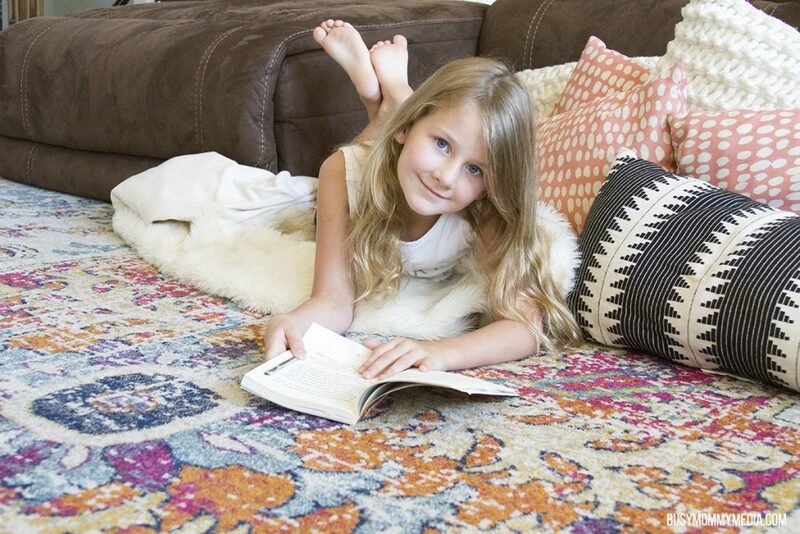 The pop of color we get from the rug brightens up the whole room. I love the way that carpet and rugs give you so much flexibility when styling a room. There are so many options out there and nearly endless styles, colors and patterns. Carpet makes the room feel so warm and inviting. With 6 kids, my house is LOUD. 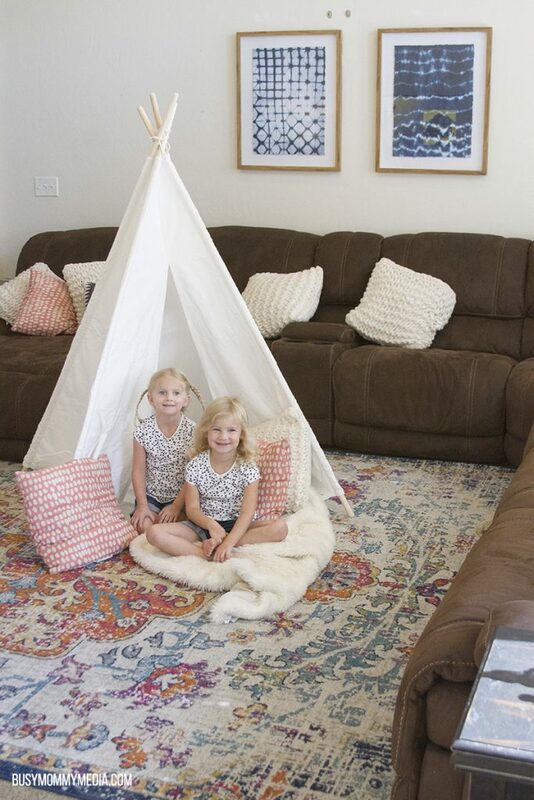 Our last house did not have carpet in the main living areas and while living there, I came to really understand how kids could be described as sounding like a herd of elephants. Carpet does such a great job of reducing the sound and keeping the chaos to a minimum in our house. 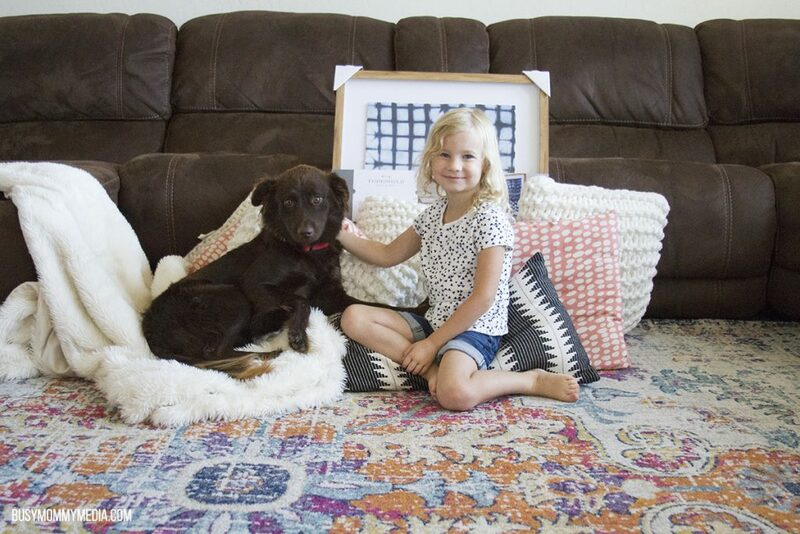 To tackle our family room refresh, we went shopping for some odds and ends and then gathered things we had around the house that could be better used in our family room. At the top of our list was new artwork. The existing canvas we had up didn’t match the rug we added to the room not too long ago and it didn’t fit the mood I wanted for the room. Movie nights are a big thing for my family so we made sure to gather lots of throw pillows and coordinating blankets so everyone could have a spot to lounge comfortably. First step is decluttering. I feel so much calmer in a room that is free from clutter. We cleared out all the odds and ends, including all the nonsense that ended up under our couch (I don’t even want to know how my kids got some of those things in there). We wiped down all the flat surfaces and left only the things that we love or use every day. Since our family room is kid-friendly, all breakables are out of reach. We loaded our entertainment center with some of our favorite books and games. Everything else we either decluttered or moved to another room. I wanted to make sure there were plenty of things my kids could use when they needed to decompress after school. We included a few favorite puzzles that the twins could pull out when they needed some quiet time. They’ll often pull out a few little quiet toys when we are watching a movie as a family because their attention span just doesn’t hold out for that long. Be flexible. I know that our family room is not always going to look picture-perfect (okay, almost never). I’m okay with that (mostly). We are in a stage that comes with lots of small toys and fort-building supplies. My kids like to drag all the pillows and blankets they own into the family room to built a “nest”. It’s cool. This is a stage. Someday I will miss this. That’s what I tell myself when I’m tripping over toys and can’t see my floor. We have a rule that we clean up the family room at the end of the day to reset it for the following day. Eight people in the house may make huge messes, but when we all pitch in, we can also clean them up quickly too. Everyone pitches in ten minutes at night and we are back to normal. Opt for carpet. 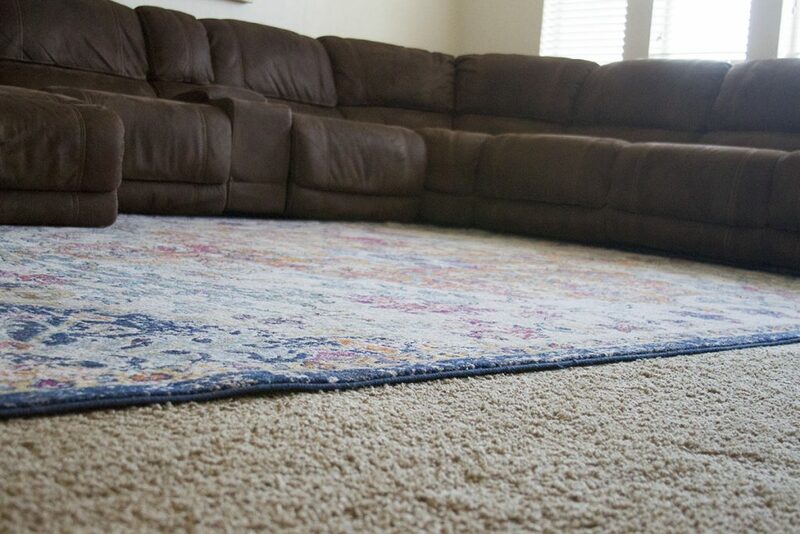 Carpet is amazing at reducing noise and it is so much cozier. 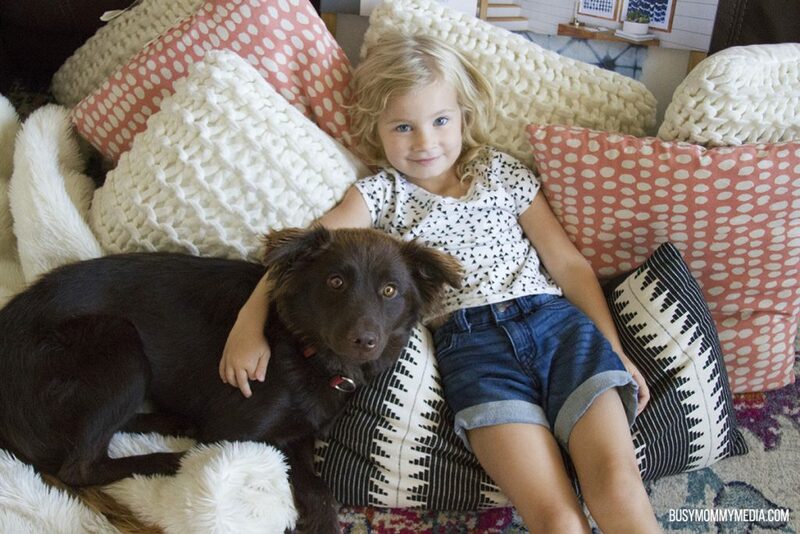 We spend a lot of time hanging out on the floor (good thing we got a giant couch!) so I love that we have a nice, soft place to sit. My boys will often throw pillows on the floor and camp out in front of the TV while we are watching movies instead of sitting on the couch. They love the feel of carpet beneath their fingers and like to have space to stretch out. With young kids in the house, I love that it prevents my kids from slipping on the floor. As much as I tell them to stop running in the house, I know that’s just not going to happen so it is nice to have a space that isn’t slippery and is soft when they land. 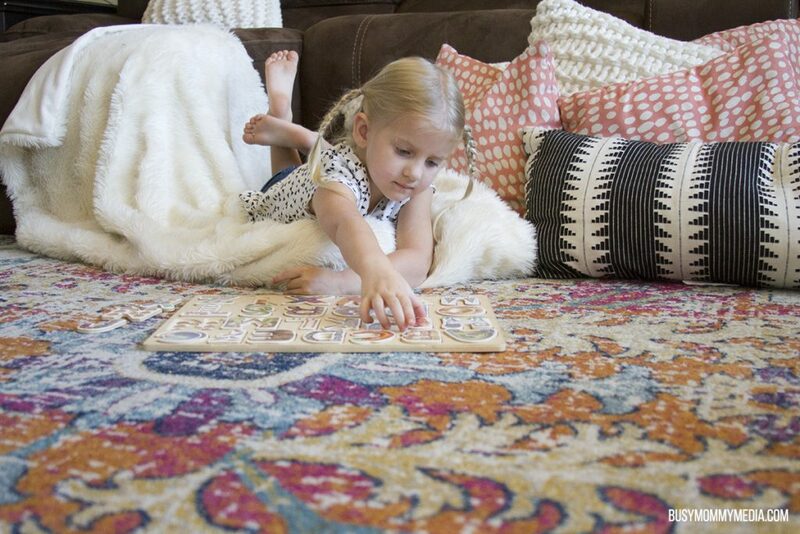 CRI has some great tips to help you choose the best carpet for your space. Limit clutter. My kids are magnets for clutter. They will pull out every toy that they own and drag it into the family room. We have a rule that they can only play with one type of toy at a time. If the other toys aren’t being played with, they need to be cleaned up. This is so much better for my stress level but it’s also a safety issue. I don’t want my kids stepping on or tripping over toys that haven’t been put away. Decorate with kids in mind. Before we had kids, my end tables and every other surface were covered in breakable decorations. Now, I still want to put some of my favorite things on display but I do it away from little hands. Use hanging shelves to put breakables above the height of younger kids or put them on display behind glass in an entertainment center. I’m so happy with the way our family room refresh turned out and glad that we were able to get it finished before my kids head back to school. I really love getting back into a routine every fall and it is so nice to have a fresh space to enjoy spending time together as a family. Want to win a $500 Visa Gift Card? Enter the sweepstakes by visiting www.beautyofcarpet.com. This is a sponsored post written by me on behalf of The Carpet & Rug Institute. Thanks for sharing. Your tips are very helpful specially on creating a kid-friendly space. Kudos!